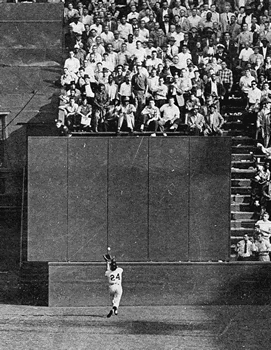 The Catch refers to a memorable defensive baseball play by Willie Mays on September 29, 1954, during Game 1 of the 1954 World Series between the New York Giants and the Cleveland Indians at the Polo Grounds in New York on a ball hit by Vic Wertz. The score was tied 2–2 in the top of the 8th inning. Starting pitcher Sal Maglie walked Larry Doby and gave up a single to Al Rosen, putting runners on first and second. Giants manager Leo Durocher summoned left-handed relief pitcher Don Liddle to replace Maglie and pitch to Cleveland's Wertz, also a left-hander. Jack Brickhouse, calling the game on NBC Television along with Russ Hodges, described Mays' catch to viewers. The audio has appeared on CD in the book And the Fans Roared, and also as accompaniment to the World Series film. "There's a long drive waaay back in center field...waaay baaack, baaack, it is...caaaaaught by Wil-lie Mays! [garbled - some say it sounds like "Say-Hey Mays"] [pause for crowd noise] The runner on second, Doby, is able to tag and go to third; Willie Mays just brought this crowd to its feet...with a catch...which must have been an optical illusion to a lot of people. Boy! [pause] See where that 483 foot mark is in center field? The ball itself...Russ, you know this ballpark better than anyone else I know...had to go about 460, didn't it?" "It certainly did, and I don't know how Willie did it, but he's been doing it all year." There is some question of the depth of straight-away center field. Sometimes there was a 475 sign in center field, sometimes 483. The ballpark was demolished in 1964, and it is unclear what was being measured when. One theory (as posed in Mysteries within Green Cathedrals, a SABR article by Phil Lowry) is that the 475 was the distance to the monument and the 483 was to the clubhouse overhang. Either way, the center field corners were well under 460. The play prevented the Indians from taking the lead and, in the bottom of the 10th, the Giants won the game on their way to sweeping the Series. The Catch is often considered to be one of the best and most memorable plays in the history of baseball because of the difficulty of the play and the importance of the game itself. Some have argued that The Catch is remembered so well in part because it was made in New York City, by a player for a New York team, and on television in a World Series game, whereas other catches (including many made by Mays) were less celebrated because they came in regular season games or in other cities. Mays himself did not believe "The Catch" to be the best defensive play he ever made. In the CD collection Ernie Harwell's Audio Scrapbook, issued in 2007, Mays talks about a running bare-handed catch he made at Forbes Field in 1951, in which the Giants' players teased the young rookie by treating him with complete indifference when he returned to the bench. Mays used to cite a catch he made against the center field wall at Ebbets Field, in which he had to scurry back so fast he did not have time to turn around. Other observers have noted that Mays' quick relay throw from deep center field was the most important part of the 1954 play, the catch itself being merely a matter of Mays outrunning the ball. In 2006, University of Illinois at Urbana-Champaign physicist Dr. Alan Nathan argued that if the weather had been 77 degrees Fahrenheit rather than 76 degrees, the ball would have traveled two inches farther than it did and The Catch would not have been completed (though Nathan's report does not take into account the possibility of Mays extending his reach or running a bit farther than he did). As Nathan said, "This is the ultimate proof of the old adage that 'baseball is a game of inches." Shortly after the 1954 Series, Arnold Hano wrote a book called A Day in the Bleachers, describing the game from his vantage point in the Polo Grounds cheap seats. He devoted an entire chapter to The Catch (and The Throw that followed it), describing everything that was going on in his head and in the stadium as the ball traversed its high arc from far away at home plate to near where the writer sat. At first, it looked like an easy catch; then, as Mays continued his full-tilt sprint, the writer became certain it was going to be over his head; then he became equally certain that Mays would outrun it: "For the second time, I knew Mays would make the catch." That chapter was reproduced in one entry in The Fireside Book of Baseball series, along with an abridged collection of that series called The Baseball Reader. Hano would also go on to write a biography of Willie Mays along with his other books on sports figures and events. The 1954 book was reissued in a 50th anniversary edition in 2004. A book called The Fans Roared, published in 2000, contains an audio capture of this play as described by World Series TV announcer Jack Brickhouse along with regular Giants announcer Russ Hodges. Brick is a little hard to hear over the screams of the crowd at the moment of the catch, but shortly afterward as the crowd settled down he said, "Willie Mays just brought this crowd to its feet with a catch that must have looked like an optical illusion to a lot of people!" He would go on to use that expression in the World Series film of this classic sports moment.